WOW, what a great day we had at the Warsaw Heritage Days Celebration! We would like to thank the Committee for inviting us to participate in their event. Wadaduga and Blue Otter, and Tiger Willow. Wado to Buffalo Sister for bringing her Mom and aunt by and visiting with us. Special WaDo for White Crow and Waya the Wolf, who the children love. Also for all the visitors who stopped by and stayed and listened to our Chief, learning something about our history, who we are and where we come from. The steady stream of people started at 8:00 am and lasted till 4 pm on Saturday, September 15, with many saying they came to see " those Cherokee's" We gave talks on history, medicine, culture, and instructions on blow guns, atlatles, bows and arrows and of course stick ball. 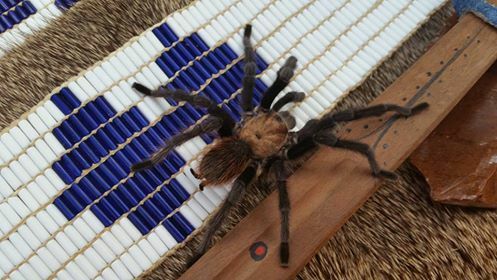 We were also entertained by a give from Creator, a wild tarantula who dropped out of the tree and prowled our tables and became the star of the show! Once again we cannot thank everyone enough for making this a success for all. Chief Kenn Grey Elk and Busy Red Bird.